The bat house is up! Look for it in our native plant garden, which is now flourishing in the once-empty urban lot behind our office. The triple-chambered bat house is the narrowest “condo” you’ll see, perched atop a 16-foot pole and just waiting for the first bats to move in. Bats like to squeeze into very narrow spaces. The trick is to mimic the space between bark and a tree trunk to create the ideal bat nursery, according to the National Wildlife Federation’s primer on constructing bat houses. Bats are a vital part of our ecosystem. They are nature’s insect removal teams. In a single night, one bat can consume 3,000 insects. And their dinner menus include pesky mosquitoes. That’s good news in Florida, where people joke that the state bird is actually the mosquito. My husband, Steve, who is a skilled carpenter, made the bat house. We have one at home in our yard, too, and Steve has made several for friends. 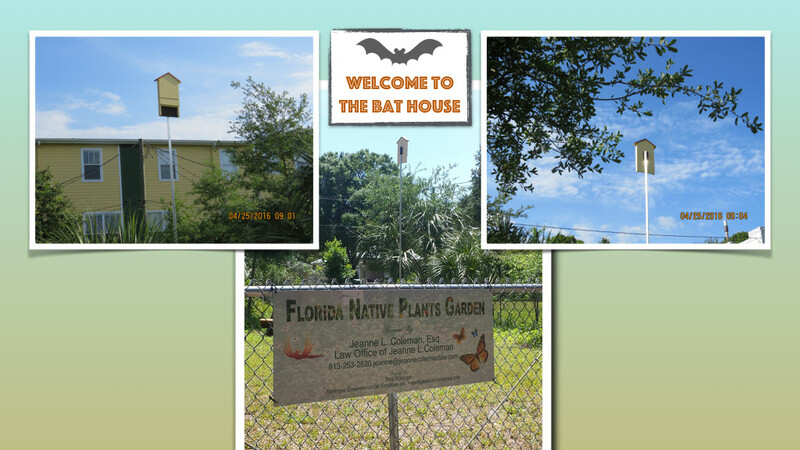 I became interested in bats and the need to preserve their habitats after hearing a talk at a joint conference of Tampa’s Sierra Club, the Native Plant Society and Tampa Audubon Society. The speaker talked about how bats, like so many other species, are facing loss of habitat as Florida becomes more and more developed. She told us why bats need protection and how individuals can help. One of the highlights … she brought bats to the meeting! I got to hold one, which I loved. It may take a while, even years, for bats to move into the new houses in my office’s natural plant garden and at my home. Bats have to discover the houses first, apparently, and the byword for those eager to see bats in their new roosting spots is patience. Perhaps the most interesting background about bats locally is the story of the old Temple Terrace bat tower. The 30-foot-tall tower was erected along the Hillsborough River in 1924 to attract bats and protect the area from malaria as the bats gorged on mosquitoes every night. Sadly, arsonists burned down the iconic tower in 1979. You can see an excellent mini-documentary (under 10 minutes) about the Temple Terrace bat tower on YouTube. It was made by the University of South Florida Humanities Institute and well worth watching. Another noteworthy bat tower is at the University of Florida across from Lake Alice. The UF “bat barn” and bat house don’t look all that big. But they are home to 300,000 bats! According to the UF website for the bat house, the bats living there eat 2.5 billion insects – each night! Go to the website to see streaming live video of the UF bat house, and recorded videos that show bats leaving their roosting spot en masse at dusk. It’s quite a sight. And one that I hope to see – on a smaller scale, granted – after bats move into the houses we’ve made, and emerge each night at twilight.